Peter "Zotec" Newman, visionary artist. 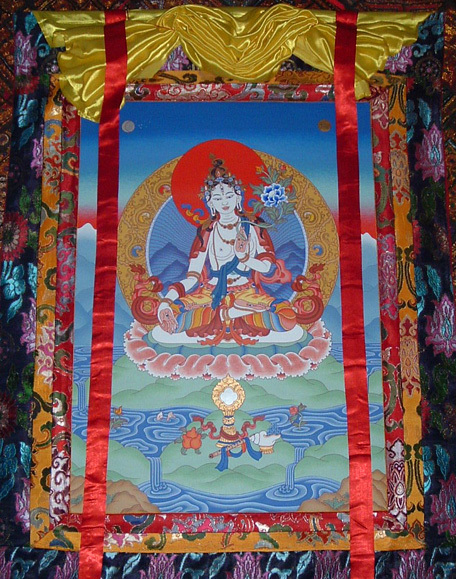 Traditional Tibetan Buddhist sacred art and original visionary paintings. "The sacred art of Tibet is a central aspect of Vajrayana Buddhism and has become a valuable inspiration to many people on their spiritual path. Traditional thangka paintings carry an inherent harmony and a rich symbolic heritage, which can help us to focus on our inner archetypes and aid us in our personal development. Meditiation on the qualities of compassion and wisdom with visualisation of deities and symbols helps to train the mind, through concentration - this in turn can help us to find clarity and purpose in life and provides a stability and calm that supports our life and work. It is an honour to be a part of this living tradition and I hope that my own vision and painting style will contribute to the evolution of a deeper human spirituality. The integration of cultural knowledge from all parts of the world is a vital part of our current task of healing ourselves and it will help us to remove obstacles to true understanding and harmonious relationships." -- Zotec. "MAY ALL BEINGS BE RENEWED BY LIFE AND HAPPINESS!" For more info, please contact the artist.